Speedtest by Ookla is pretty much the go-to tool for testing internet connection speeds. 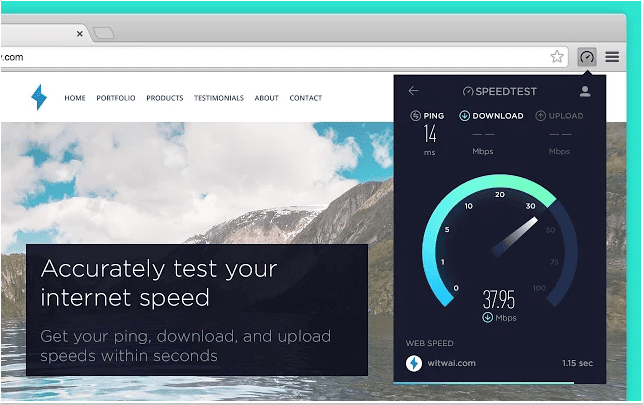 Their web-based Speedtest has become, for the most part, the industry standard. It’s popularity and wide spread use has even birthed Speedtest Awards, which uses the results from testing to present a list of fastest ISP’s and Mobile networks by country. I have used Speedtest and Speedtest mobile for as long as I can remember and honestly have no reason to change that. Best of all, it’s free. Speedtest has now become even easier to use with the addition of an Official Extension for Chrome. The extension, which resides in the Omnibar, allows you to test ping, upload and download speeds with just one click without leaving the page you’re on. Ookla has also added a web speed test that will test the page load speed of the site you are currently viewing. This is a very clever feature if you are having speed issues and want to determine if it’s your connection or the website you’re viewing. While you can still visit Speedtest’s website to perform these tests, this is just one more example of streamlining your desktop. Increasing productivity and creating a more fluid workflow is what it’s all about. Chrome continues to push forward in this arena. Thanks Ookla for a really awesome addition to the Chrome experience. You can grab the Speedtest extension directly from The Chrome Web Store. Just click here.